US envoy Bill Richardson is travelling to North Korea at Pyongyang's request on an unofficial diplomatic mission to try to ease regional tensions. Mr Richardson, who has been to North Korea several times in recent years, said he hoped to persuade the country's leaders to "calm down a bit". 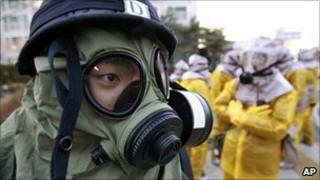 Tensions have been especially high on the peninsula since the North shelled a South Korean island, leaving four dead. The visit comes as the South staged its biggest ever civil defence drill. The drill was aimed at quickening the country's response to any further attacks from the North, following the 23 November shelling of Yeonpyeong island. During the 15-minute exercise, South Koreans were guided to 25,000 shelters in subways and office basements, while fighter jets flew over major cities to simulate airstrikes. Bill Richardson was invited to Pyongyang by Kim Gye-gwan, North Korea's lead negotiator in the stalled six-party talks on his country's nuclear disarmament. Mr Richardson is the governor of New Mexico, but has often acted as a diplomatic troubleshooter and has visited North Korea several times in the past two decades. The US state department says he is not delivering a message to the North Korean government for President Barack Obama. Before leaving the US, Mr Richardson said he would talk to the White House on his return. "My objective is to try to get North Korea to calm down a bit, see if we can reduce tension in the Korean peninsula," he said. Analysts say his invitation is a sign of North Korea's frustration at being denied formal negotiations with the US. Pyongyang and its main ally, China, have been calling for a resumption of the six-party talks. But South Korea and the US have said the North must stop its "provocative and belligerent" behaviour and take action to roll back its nuclear work. On Tuesday, the US state department said North Korea had "at least one other" uranium enrichment site in addition to the one shown to US experts last month. This view was echoed by South Korea's foreign minister. Uranium can be enriched to provide fuel for nuclear power reactors, as Pyongyang says it is doing, or it can be enriched more highly to provide material for nuclear weapons. North Korea has conducted two nuclear tests and is believed to have enough plutonium to make about six bombs.